There are few better feelings than creating a haven from the world within your own four walls. With the addition of greenery, a home can become a relaxing oasis that not only feels good, but also looks good. We know not all plants are created equal, so what perennials should you place around the house and which should you avoid? Why green up your home? While not advocating to grow an indoor forest, there’s something about a house that looks and feels alive with the presence of greenery. It could be a jaunty cyclamen on the windowsill or succulents on a side table. Hanging air plants can add a contemporary look if you’re short on flat surfaces, or growing off-cuts from fruit or vegetables on the windowsill can make good science experiments for the kids. Interestingly, many plants suited for indoors originated in tropical or subtropical environments. This is due to their leaves’ ability to photosynthesise well and grow in reduced, indirect sunlight—something common to many hot jungle areas as well as a living room or bathroom. All plants purify the air we breathe through photosynthesis, taking in carbon dioxide and producing oxygen. But some are also very effective at filtering out nasty pollutants and toxic chemicals. NASA’s Clean Air Study found that some plants are capable of eliminating significant amounts of benzene—found in vehicle exhausts, glue, paint and furniture wax; formaldehyde— found in paper bags, waxed tissues, paper towels and particle board; and trichloroethylene—which is common in printing inks, varnishes and adhesives. These are all common chemicals best not to be inhaled. The plants that purified the air from all three chemicals included English ivy, peace lily, bamboo palm, snake plant (also known as mother-in-law’s tongue), certain types of dracaena, barberton daisy and chrysanthemums. 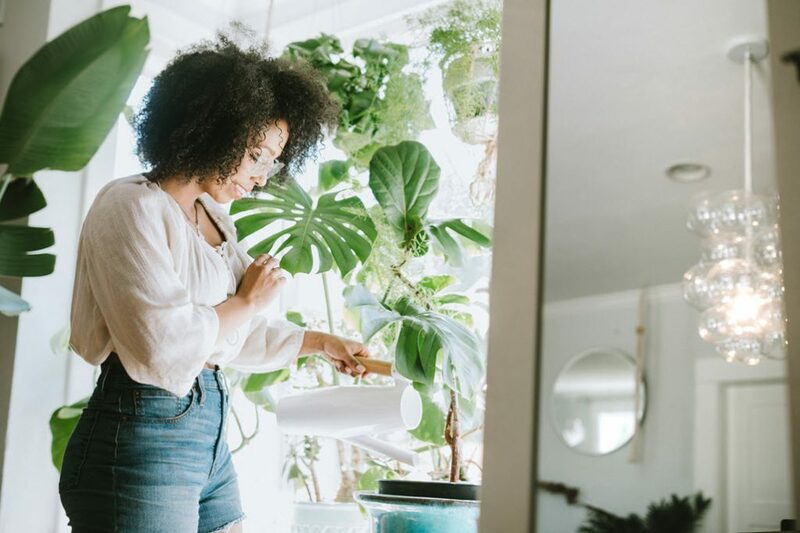 Other plants such as aloe vera, types of philodendron, dwarf date palm, Boston fern and weeping fig were also very effective at filtering out formaldehyde (found in virtually all indoor environments. If you’re prone to hayfever, you’ll obviously want to avoid flowering plants and grasses. They may look beautiful, but the constant running nose just isn’t worth it. However, there are a multitude of colourful options you can enlist to avoid that springtime sneezing. There are several low allergy houseplants that often have larger leaves and can make a statement in your home. Palms, peace lilies and dracaena make great low-allergenic additions to a home. Chamomile and sunflowers are two high-pollen candidates for hayfever sufferers to avoid, and fig trees should be shunned by anyone with a latex allergy due to a chemical in the tree’s sap. If dust is not your friend, you can still house greenery in your home. Just use wide leafed plants such as orchids or bamboo and wipe down the leaves every week or two. There is a long list of plants which are dangerous for animals. Some of the most poisonous are crocus plants, fiddle leaf fig, some types of lilies, azaleas, oleanda, daffodils and tulip bulbs. If ingested, these plants can make your fur-babies start vomiting, give them diarrohea and even stop their heart or breathing. If you suspect your pet has eaten something they shouldn’t, take them to the local vet with a sample of the offending plant immediately. If you have little ones, you know that they’ll put anything they can reach into their mouths. So while you’ve got babies and toddlers underfoot, you’ll sleep better if you’re not having to vigilantly watch for them trying to eat plants perched enticingly around your house. Poisoning can occur from just touching the leaves or sap of a plant in some cases. Many plants that are toxic to animals are also toxic to their human companions. The most serious reactions in humans can be caused by pothos (also called devil’s ivy for obvious reason), peace lily and caladium. These can all cause very dangerous symptoms such as throat or tongue swelling, difficulty breathing and irregular heartbeat. If you struggle to keep anything other than mould alive in your house, there are some options for you. Agave, jade plant and snake plants are all notoriously difficult to kill. And if watering very occasionally still seems too taxing, dogwood, cherry blossom and cotton branches can all provide a temporary splash of colour and life to your home and don’t require any watering.